Intrigued by the buzz among FB friends, today, once and for all, I went with a group of fun-loving jump-shooting friends, to see and experience what this island has to offer! Well, not really all of the island. Quite literally, just the shifting sand bar! Why? Eh, the play in our 'very young' hearts persisted. Quite different from the usual 'see and feel everything in one sweep' solo backpacker mindset of your aging Pinoy Traveler haha! Happy? I would rather say... I Shall Return. Thus, the title of this story! This is not an easy destination. Even if/as you prepare. 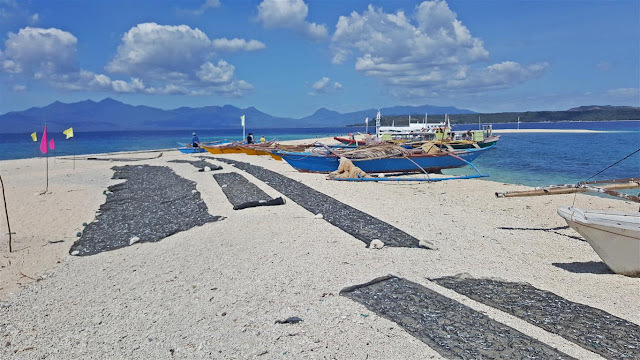 First, there is only one regular commuter trip a day from the town of Naval, the capital of this island-province (Biliran). And it happens only at 12NN! Oh okay, that would actually be two trips, since there are two boats. But they leave (per their regular schedules) at exactly the same time - 1200H, noontime, mid-day, tanghali, udto, mahiru! Hesus gino-o ko! And the return commute? Its at 7:00AM everyday, also by the said boats! Therefore, when going to Higatangan on public commute, you won't have a choice but to stay overnight on the island! Hey, a day before we set out to Naval from Tacloban, a friend of a friend of a friend purportedly told one of us that there is a commuter boat every 7am. So we were gunning for this one. But on arrival at the pier, we were told, therefore realized that there is no 7am trip. Grr!! Alright, at the island, there are 3 or 4 resorts big and small. But we never went to any!!! Yeah, thanks in part to the time we wasted at Naval port looking for a ride to this island. Our other companions used the time buying this and that at the stores surrounding the port, so we had everything we needed - from food to just about anything, including ice-cold-beer! Yeah! When we docked at the sand bar area (nearest resort is Limpiado White Beach Resort), we learned from our boatmen that they'd just be hanging around to wait for us, instead of going back to Naval then return in the afternoon to fetch us. So we asked if we can leave some of our things on board. The reply was, "you can leave everything here as we are not going anywhere unless you say so"! So, there! We had an instant open air accommodation haha! The boatmen even helped our girls in preparing our food! Hey, even at the sandbar area alone, snorkeling is already fun! And yes we tried it and heeded the advise of boatmen, 'don't go far out as the water current is really very strong'. True! There are no public toilets, and we did not go into any resort, remember? So our companions who needed to do so, just had to beg at some of the houses and/or the Limpiado resort itself hehe! Tourists cannot have all of the sandbar to themselves. A bigger portion is (still) used by locals as their drying area for fish. Anyway, that portion (nearer the houses) have coarser sand and some rubbish that were probably thrown by both visitors and locals. Haaay mga kababayan ko, ang disiplina pleaseeee! But... happy to have learned there is San Miguel Light and Marlboro Lights on most stores hehe! I have not been able to peep at the locale, as I said above, because we forgot all about time because we were playing at the sandbar area. Therefore, I shall return!